Audience: As is in any marketing strategy, content marketing too starts with identification of customers, demographic and psychographic study and classification. Upon completion of the same, the content marketer needs to listen to them on social media, blogs, speaking events, etc and understand what issues and topics they are talking about. Once this is determined, select the ones that is addressed by your firm, which is the target topic to hit your audience with. 1. Secondary research: Google to understand what is the exact body of knowledge. 2. Primary research: Connect with people in your organisation on their point of view, connect with eminent people in your circle or connected through people in your firm to get their opinion and collate the same. 3. Explore possibility of doing some number crunching for local marketing and relevant to your target audience. 4. Build chain to thoughts in order to ISSUE –> STATS –> SOLUTION –> YOUR FIRM’S AFFIRMATIVE ACTIONS. 5. Script: Once the thoughts are in place, get a content writer to pen everything in following manner which ever is suitable: Blogs, Whitepaper, Publication, Speaker event. 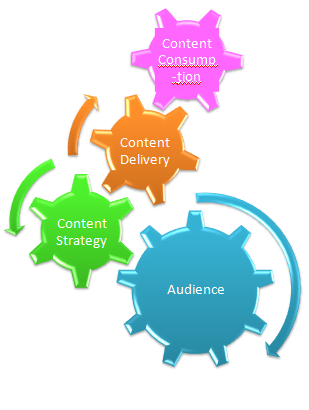 Content Delivery: Distribution of content depends on kind of content. If its blog then it goes with your blogs section, Whitepaper goes with slideShare. A Speaker event record goes into YouTube. You must have the following platforms to ensure effective delivery: SlideShare, YouTube, Blogs section, Facebook, LinkedIn, Newsletters, Closed customer Groups on LinkedIn, Email distribution list. One could reuse content by say blogging about a speaker event or whitepaper on the same. Ensure there is some new developments covered while reusing content. Listening: Once your content reaches your audience, follow up with them about their thoughts by a phone call, their comments on social media, blogs. Doing so would really ensure they participate and provide their opinion. This again could be a content creation lead! Remember, A blogger who blogs often, seldom falls short of topics to blog on! Benefits: Since you are involving people from your organisation for content creation, there is information passing into your organisation about needs of the market and knowledge passing from experienced professionals to the needy. Since clients see your people and their desires to be part of the solution, there is greater trust and faith that the issues will be resolved. In todays highly competitive environment, companies are finely segmenting their market and optimizing their product to delight their target segment. 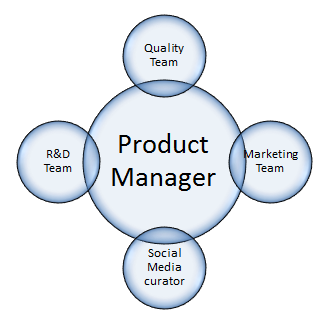 Since aspirations, desires and expectations of the target segment keeps changing, companies are constantly tweaking their products and innovating to adopt to the demand change. The House of Quality (HoQ) Matrix is the most recognized and widely used form of Quality Function Deployment (QFD) to achieve this end. It translates customer requirements into an appropriate number of engineering targets to be met by a product design. Raise of Social Media is fast changing the way companies interact with people and how people interact with companies. People are freely communicating their true feeling on this platform and companies are trying to find ways to capture this data and use it to its benefit. How to couple Social Media to House of Quality? Once we cautiously bring the team together and set context we must bring clarity on role of each stake holder. Applying principles of change management would be a good starting point for implementation. As is the case in every process, no one size fits all and every firm must find their sweet spot. What are the top 3 Key Benefits? Social Media would help House of Quality document become a continuously changing and accurate document that can be referred by R&D team regularly and produce products that delight customer. More transparent and system driven approach to understanding customer requirements and allocating resources to meet the requirements. In conclusion, House of Quality needs to be a very dynamically updated and proactive document. In order to achieve this, we need to get customer input for the document in real time. Social Media could help us do so in a systematic manner. Achieving this feat would ultimately provide companies with competitive advantage and help them delight their customer.